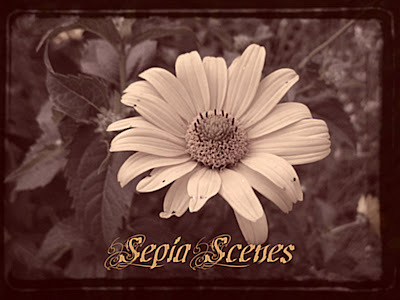 Welcome everyone to Sepia Scenes for Thursday, April 30th. You of course can post your photos on Wednesday, April 29th, at 4:00 PM EST and then any time after that. 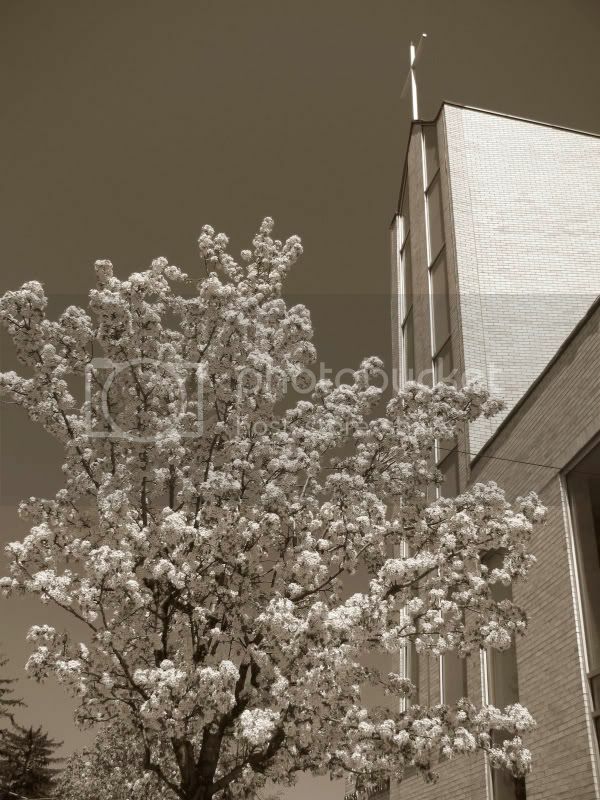 My photo is of a Presbyterian Korean Church in Queens, N.Y. with a whole series of ornamental pear trees in full bloom outside. I think you will notice that the sepia color of my badge and the sepia color of my post for this week are different. You can accomplish any particular tone of sepia by using the Channel Mixer in Adobe Photoshop or other photo-editing software. In channel Mixer you desaturate the photo, i.e. make it black & white. A very strong sepia (lots of red and yellow) will cover your entire photo. On the Layer palette click the drop down menu and click Soft Light and modify Opacity to 65% or even lower if you like my sepia tone. My color tends toward a sepia/gray tone. The badge above has more red in it. Please sign Mr. Linky and leave a comment. Visit your fellow participants too. Thanks a lot! **I have a note in to Mr. Linky asking why those who sign in here or at Sepia Scenes are getting double links... Don't worry I hope it will be fixed soon.It has been fixed. But I lost all the linkies here. Don't worry I have your comments. Will you please look at the comments to visit the early posters? Thanks everybody! Nice picture, but it does looks more B&W then sepia. The ornamental pear tree is lovely. The photo makes me think of my childhood for some reason. Memories in sepia tones.. I like the air of mystery in the window shot in your header. The blossoms of the ornamental pear look so fragile; a picture of delicate beauty. Lovely contrast with the more "severe" straight lines of the building! Great shot! What a beautiful angle to take your shot. The best of the soft and hard angles. Same Mr Linky for the two memes. Such beautiful blossoms and a great view with the church behind. I loved the ornamental pear tree last week too! Looks like cotton growing in monochrome. Neat effect. Mine this week is one I just shot as a sepia image. No conversion required. Funny how people seem to cluster around similar subjects from week to week. I tried a tree for a change and here you are with you pretty pear tree. It must be SPRING's inspiration. The dramatic angles of the steeple and cross as they reach the heavens is superb. The sepia enhances the spiritual mood - although I can't say why. But it works so well! Hi, Mary! I learn something new every time I come here. The tree looks amazing, you see so many kinds of sepia, it's wonderful. The ornamental pear tree is to die for, Mary. mine is much 'browner' in the sepia tones this week --- maybe 'warmer' is the term i want? more architecture from my UK trip. Mr. Linky worked fine just now. Look where my mind is, lol. Your pictures inspire me to look around and breathe in the spring. Hi Mary. Looks like a lot of people disappeared on Mr. Linky (including MOI!!) Sob. Ah, more lovey pear blossoms to soften the severe angles in the church. I haven't figured out PSE yet, Mary. I'm a long ways away from getting the full program! I love the interior shot for your blog header. Well done Mary -- and thanks for the sepia tips! Beautiful tree - you caught it right at its peak. That's a beautiful blossom and a cool angle! thanks for the tutorial, your picture is lovely. I'm also absolutely loving your new photo header.